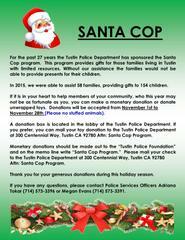 For the past 27 years the Tustin Police Department has sponsored the Santa Cop program. This program provides gifts for those families living in Tustin with limited resources. Without our assistance the families would not be able to provide presents for their children. In 2015, we were able to assist 58 families, providing gifts to 154 children. If it is in your heart to help members of your community, who this year may not be as fortunate as you, you can make a monetary donation or donate unwrapped toys. Donations will be accepted from November 1st to November 28th (Please no stuffed animals).